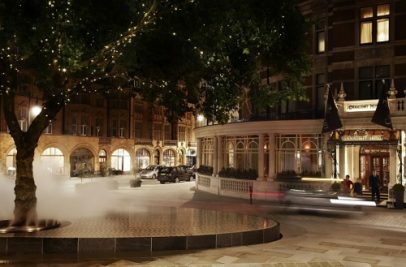 It’s not long to go now till the switching on of this year’s Mount Street, Mayfair Christmas Lights and the eagerly awaited presentation of The Connaught Christmas Tree for 2017. This will all take place on the evening of Thursday 30th November. The arrival of the tree will mark the start of the festive season on Mount Street in Mayfair. Last year’s memorable tree – Pillar of light: was designed by Antony Gormley. While this year’s Connaught Christmas Tree is to be designed by Tracey Emin CBE. Tracey Emin is an English contemporary artist known for her autobiographical and confessional artwork. Most people will probably remember her for one of her most famous pieces “Unmade Bed.” So her interpretation for a Christmas tree will no doubt be as equally spectacular. Mount Street is situated in the heart of Mayfair’s luxury shopping district. Situated between South Audley Street and Carlos Place, just outside The Connaught Hotel. So if you are looking for a great festive night out in Mayfair come along to the switching on of the Christmas lights and the presentation of the tree. The festivities along with the switching on of the Mount Street, Mayfair Christmas lights starts from around 5:30 pm in the early evening and is sure to be a great night out.